Learn all the Spanish New Year wishes online, in your own time, on any device! Join SpanishPod101 for a special Spanish New Year celebration! So, how do you say Happy New Year in Spanish? Let a native teach you! 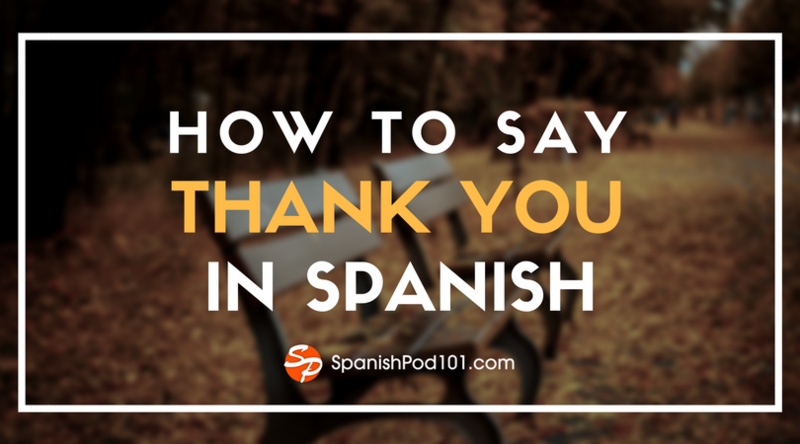 At SpanishPod101, you will learn how to correctly greet your friends over New Year, and wish them well with these Spanish New Year wishes! Must-Know Spanish Words & Phrases for the New Year! 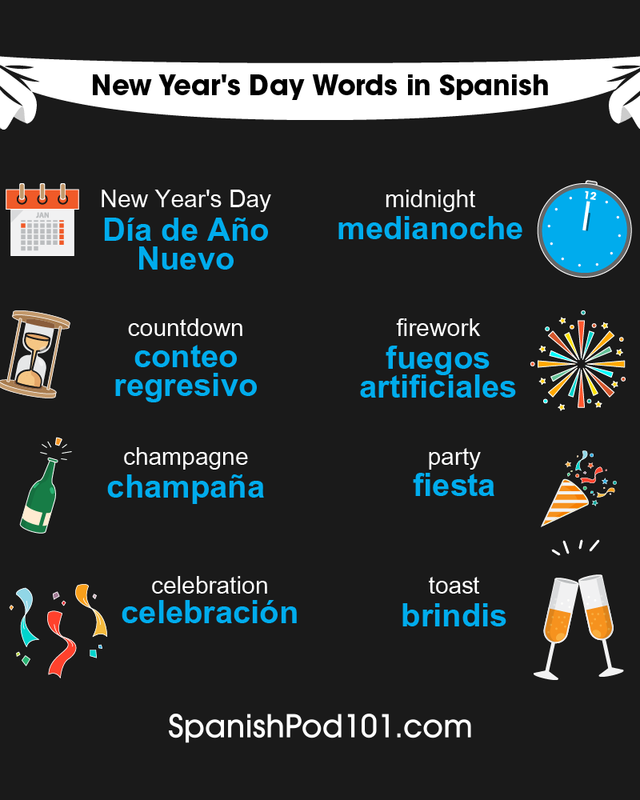 But let’s start with some vocabulary for Spanish New Year celebrations, very handy for conversations. Let’s talk about a day full of excitement, wishes, and resolutions for the Spanish people. It is called “Noche Vieja” (”New Year’s Eve“), and it is the last night of the year, the one that marks the beginning of a new year. This holiday does not stop until the next day, January 1. Do you know why there is a tradition of eating grapes on New Year’s Eve? Keep reading and you will find out at the end! Before midnight, it is common to have a big dinner, similar to Christmas, with all the family. On the television, all programs show New Year’s specials. The best comedians and most famous celebrities participate in these specials. Musical concerts are also common, from current and in-vogue singers, to those known by grandparents, parents and children. As 12 o’clock approaches, you can feel the excitement. The bowls are prepared, and it’s confirmed that each contains twelve grapes. The most traditional place to eat grapes is La Puerta del Sol in Madrid. But nowadays, it is done in all cities, and it’s also common to eat them at home, in front of the television. You hear the bells chime every year. And…ton, ton! It’s finally time to eat the first grape, the second…but be careful! Every year, there are cases of choking. Once the New Year starts, it’s normal to congratulate, hug and toast with all the family. In those toasts, it is normal to put a gold ring into a glass to attract money. From this moment on, the phone lines will be overloaded and everybody will send and receive congratulatory messages and phone calls from friends and family members. After that, it is common to go out into the street, or to a pub or nightclub. And then it’s time to celebrate until you can no longer stand! It is normal on this day to wear new clothes for the first time, but not only that! It is also tradition to wear a new set of underwear for New Year’s Eve. Normally, it will be yellow in color if you want to attract money, or, more often, red, if you want to attract love. And now, the answer to the earlier quiz. Do you know why there is a tradition of eating grapes on New Year’s Eve? It seems this tradition doesn’t have any religious or cultural motivations; it is actually economical. On New Year’s Eve of 1909, the grape harvesters had had a big harvest of grapes, and because of this, they invented the tradition of eating the lucky grapes on the last night of the year. 2. Must-Know Spanish Words & Phrases for the New Year! This is pretty self-explanatory. Most countries follow a Gregorian calendar, which has approximately 365 days in a year, while in some cultures, other year designations are also honored. Therefore, New Year’s day in Spain could fall on a different day than in your country. When do you celebrate New Year? New Year celebrations are a huge deal in some countries! Parades are held in the streets, often to celebratory music, with colorful costumes and lots of dancing. Parades are like marches, only less formal and way more fun. At SpanishPod101, you can engage in forums with natives who can tell you what Spanish New Year celebrations are like! So, you learned the Spanish word for ‘resolution’. Fabulous! Resolutions are those goals and intentions that we hope to manifest in the year that lies ahead. The beginning of a new year serves as a good marker in time to formalise these. Some like to do it in writing, others only hold these resolutions in their hearts. 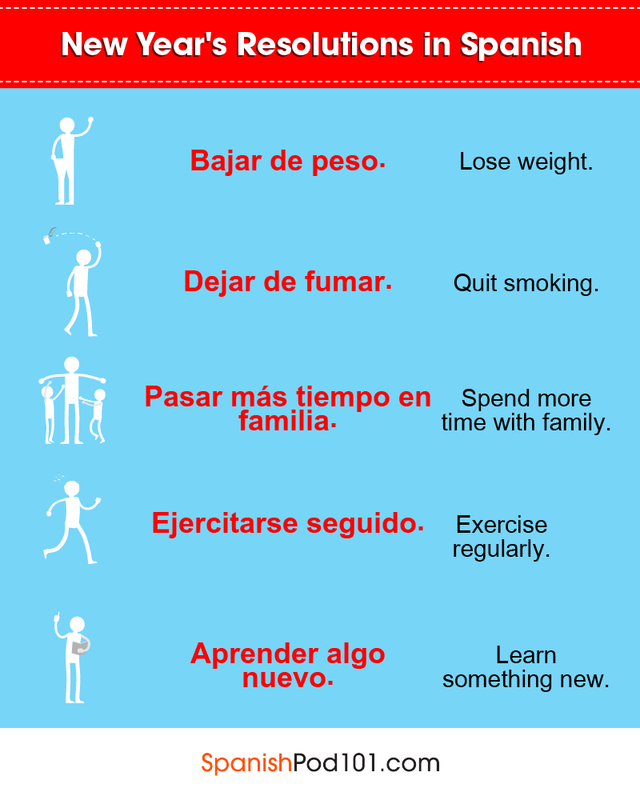 Here are our Top 10 New Year’s resolutions at SpanishPod101 - what are yours? Learn these phrases and impress your Spanish friends with your vocabulary. Reading is a fantastic skill that everyone can benefit from. You’re a business person? Apparently, successful business men and women read up to 60 books a year. This probably excludes fiction, so better scan your library or Amazon for the top business reads if you plan to follow in the footsteps of the successful! Otherwise, why not make it your resolution to read more Spanish in the new year? You will be surprised by how much this will improve your Spanish language skills! Pasar más tiempo en familia. Another common and difficult resolution! However, no one has ever been sorry when they saved towards reaching a goal. Make it your resolution to save money to upgrade your subscription to SpanishPod101’s Premium PLUS option in the new year - it will be money well spent! Of course! You can only benefit from learning Spanish, especially with us! Learning how to speak Spanish can keep your brain healthy, it can widen your circle of friends, and improve your chances to land a dream job anywhere in the world. 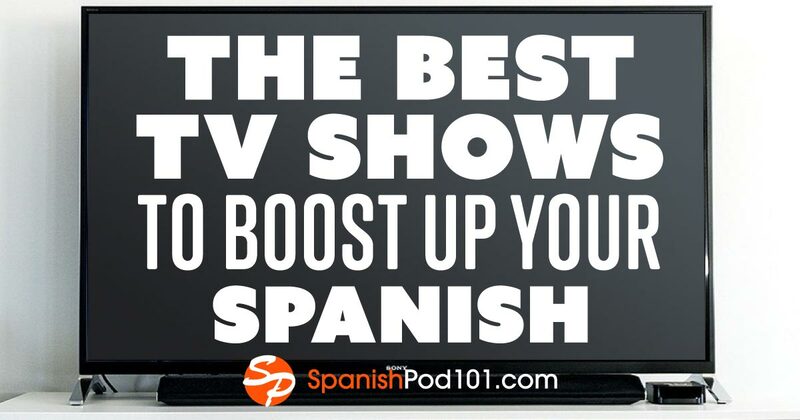 SpanishPod101 makes it easy and enjoyable for you to stick to this resolution. Click here for quotes that will also work well in a card for a special Spanish new year greeting! Make decorative notes of these in Spanish, and keep them close! Perhaps you could stick them above your bathroom mirror, or on your study’s wall. This way you not only get to read Spanish incidentally, but also remain inspired to reach your goals! Imagine feeling like giving up on a goal, but reading this quote when you go to the bathroom: “It does not matter how slowly you go, as long as you do not stop.” What a positive affirmation! Still undecided whether you should enroll with SpanishPod101 to learn a new language? There’s no time like the present to decide! Let the following Language Learning Quotes inspire you with their wisdom. As legendary President Nelson Mandela once said: “If you talk to a man in a language he understands, that goes to his head. If you talk to him in his own language, that goes to his heart.” So, learning how to say Happy New Year in Spanish could well be a way into someone special’s heart for you! Let this year be the one where you to learn how to say Happy New Year, and much more, in Spanish - it could open many and unexpected doors for you. Here’s a lovely bonus for you! 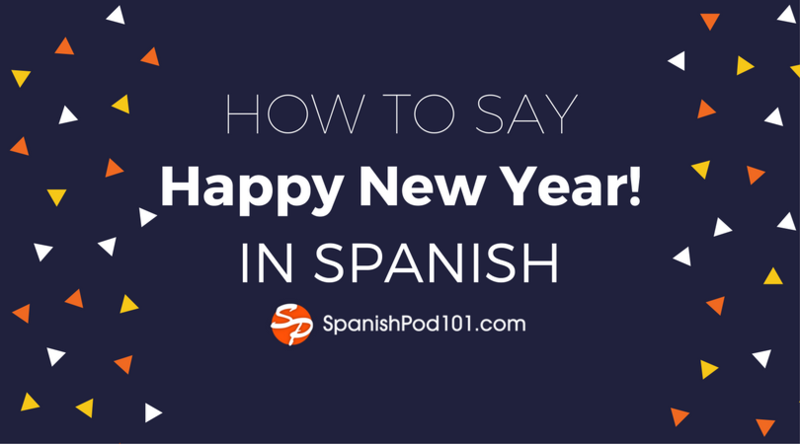 Why stop with Spanish - learn how to say Happy New Year in 31 other languages too! Watch this video and learn how to pronounce these New Year’s wishes like a native in under two minutes. 7. 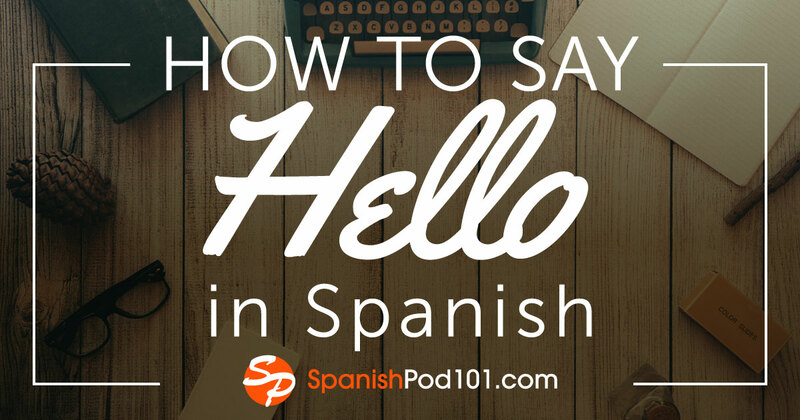 Why Enrolling with SpanishPod101 Would Be the Perfect New Year’s Gift to Yourself! If you are unsure how to celebrate the New Year, why not give yourself a huge gift, and enroll to learn Spanish! With more than 12 years of experience behind us, we know that SpanishPod101 would be the perfect fit for you. There are so many reasons for this! 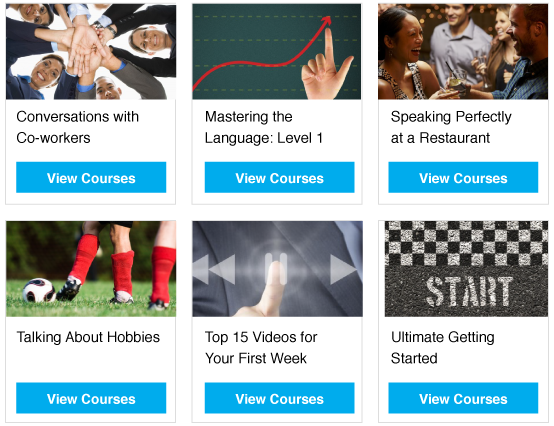 Custom-tailored Learning Paths: Start learning Spanish at the level that you are. We have numerous Learning Pathways, and we tailor them just for you based on your goals and interests! What a boon! Marked Progress and Fresh Learning Material Every Week: We make new lessons available every week, with an option to track your progress. Topics are culturally appropriate and useful, such as “Learning how to deliver negative answers politely to a business partner.” Our aim is to equip you with Spanish that makes sense! There’s no reason not to go big in 2018 by learning Spanish with SpanishPod101. Just imagine how the world can open up for you!